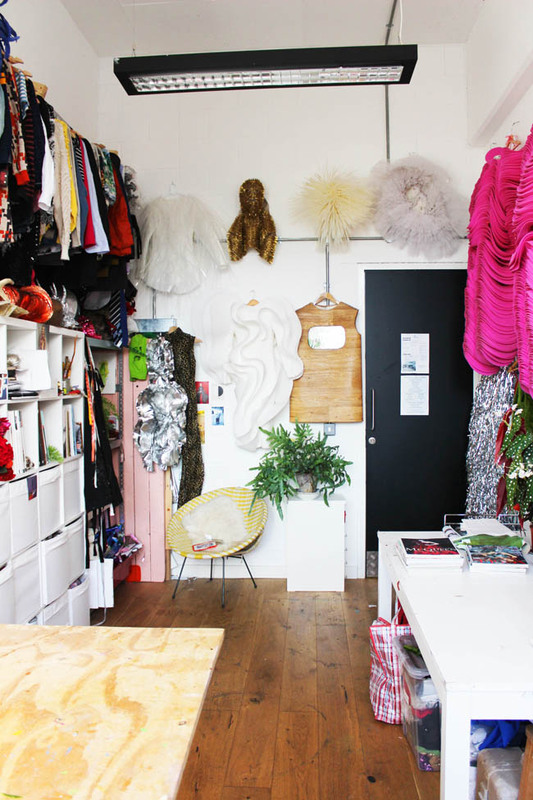 For today's sewing space tour where we peek behind the closed doors at a maker's inspiring sewing space, we're in London with Kate Tabor, the extraordinary costume designer, stylist, and maker. Kate's impressive work is well known for being in music videos for artists such as David Bowie, Kylie Minogue, The Chemical Brothers and many more. Her work has also been featured in films and commercials and she just so happens to work in the same building as us! 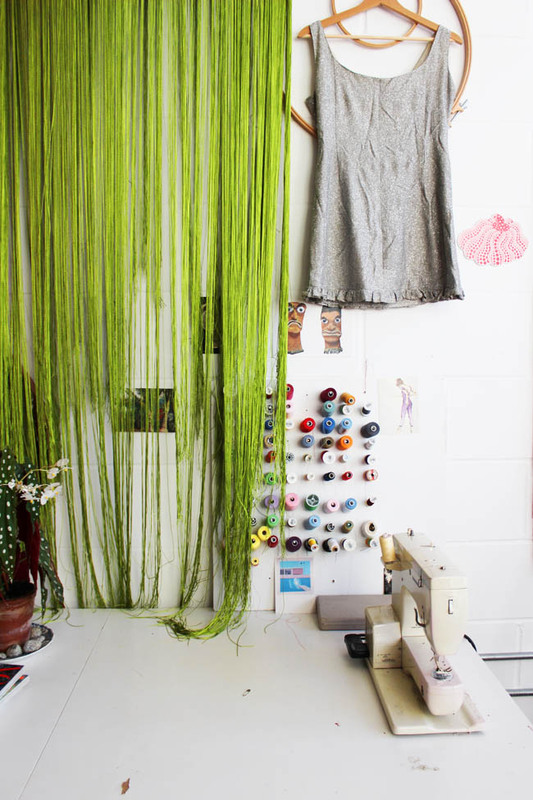 Her studio is awe-inspiring and original, we've admired her space for years and feel privileged to share her fascinating studio with you. I made this piece for The Chemical Brothers world tour visuals, it is one of four that was worn by dancers for the track 'Keep on Mak'in Me High'. This piece is made from Plasterzote which I cut into rings and threaded together to form the bodies. 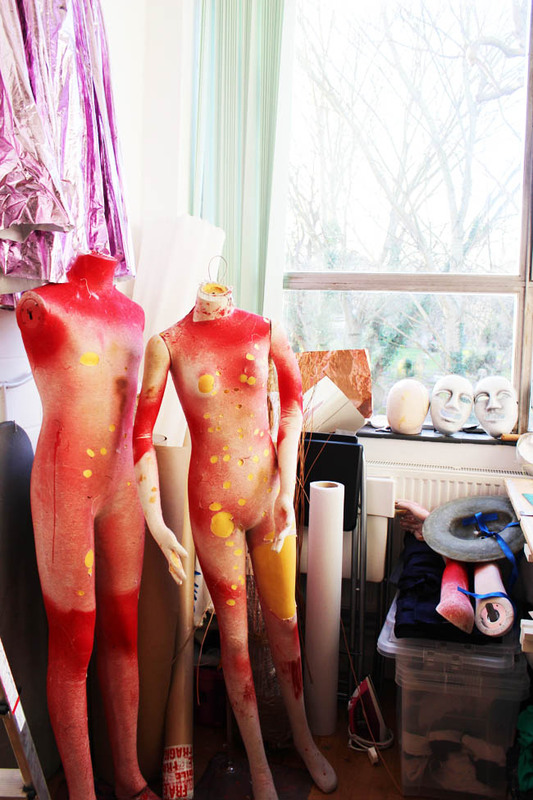 I'm a Costume Designer living and working in South East London. I work in music and film, designing and making weird and wacky costumes. 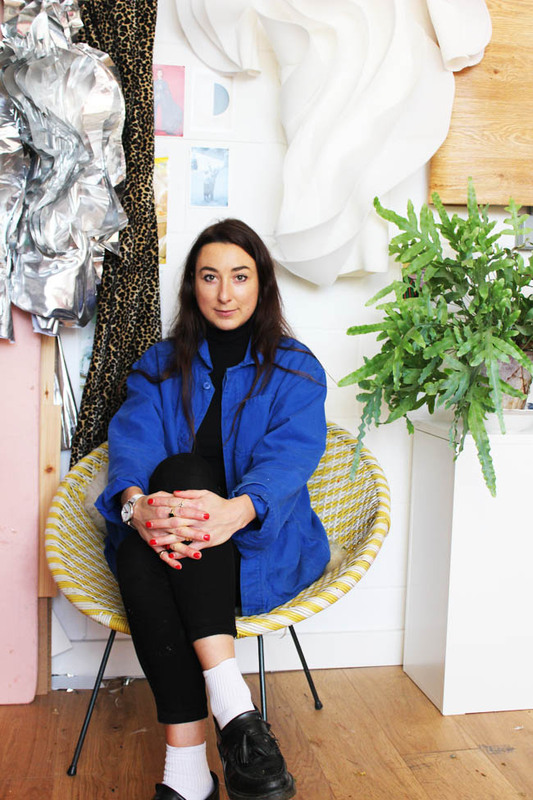 I specialise in using unusual fabrics and fabric manipulation to create unique pieces for each project. 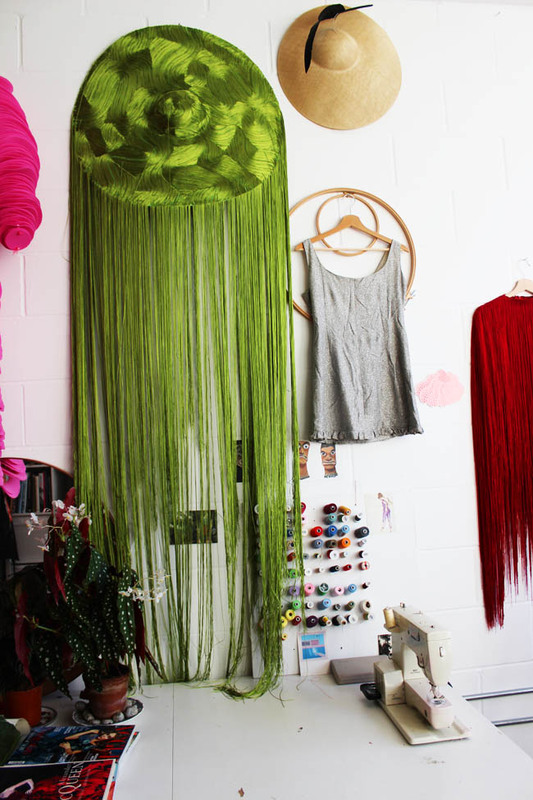 My studio space is where all my creations happen. 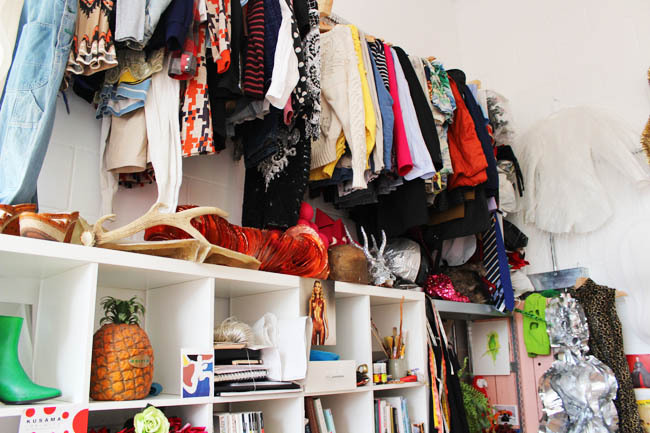 My space is very bright and colourful, the ceiling is high so I have a lot of wall space that's mostly covered with my favourite costumes that I hang after they've been used. I have lots of postcards from exhibitions dotted around that inspire me as well as shelves full of magazines and books. I also like to have lots of plants in my space to keep it feeling fresh and alive. 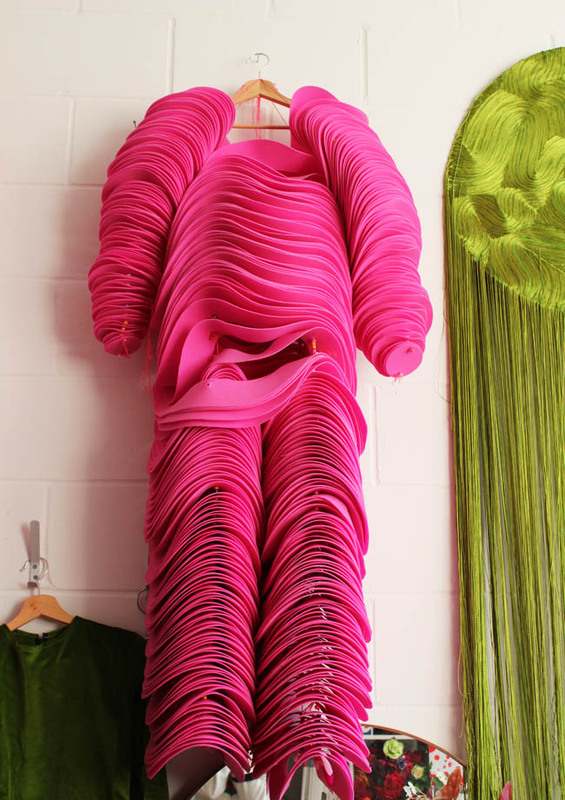 My fish tank dress was a personal project, I was inspired by a wooden fish tank I had seen in a Japanese restaurant. The dress is made from wooden lino that I riveted together and the fish tank is made from clear acrylic plastic. When I’m designing I have a 1960s yellow chair which sits at the back of the room next to all my books. I like to sit here and sketch before I begin the making process. I have two large tables in my space, one is my cutting table and the other is split in two - one half is for my sewing machine and the other is the messy end for gluing and painting. This costume was used for a stills photography shoot with photographer James Day called Dancers. 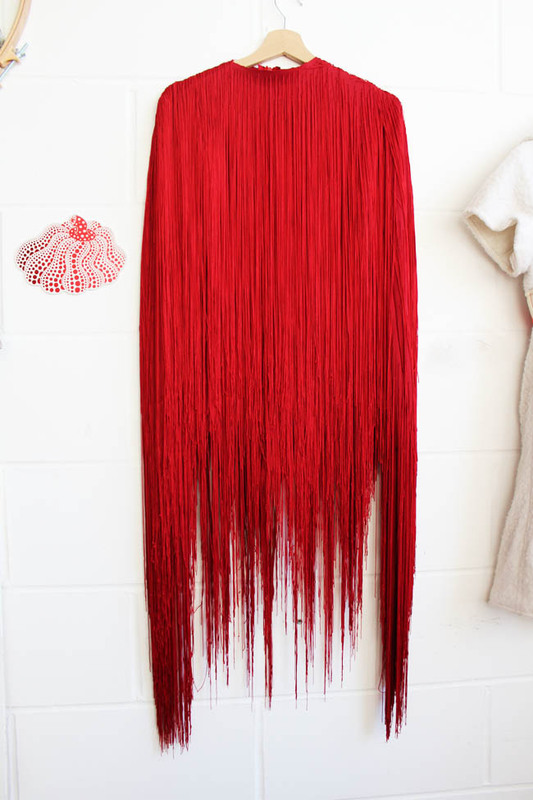 The red body is made up of acetate fringing which I snipped into individual pieces and threaded each one through the base garment evenly letting the majority of each fringe hang from the garment. I work a lot on my sewing machine which is an old style Bernina. I treasure it very much - it never lets me down even when I put strange materials through it. As well as machine sewing, I do a lot of hand sewing to construct the costumes. When I need to work on a more 3D shape, I have two full body mannequins - a female and male - that I work off. I also prefer to use these when I do my pattern cutting, as I like to cut on the stand to get my pattern pieces for each costume. I have a big shelving unit full of all my bits and bobs. I have drawers for each thing - like a zip draw, trimmings draw and fake flower draw. I feel I work more efficiently when the studio is as organised as possible. 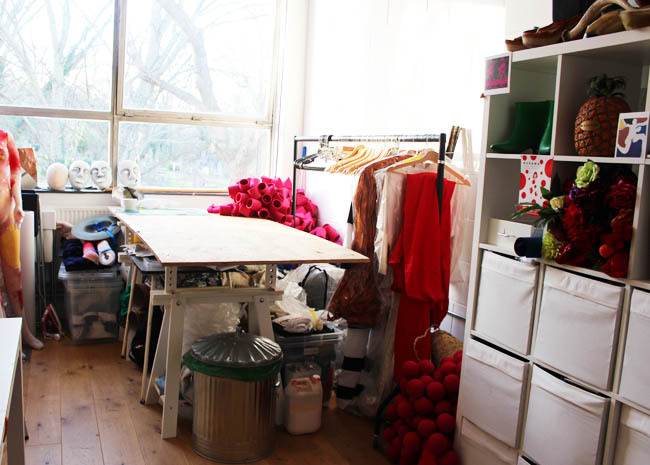 Some of my projects can be on a large scale and I’m always working to tight deadlines so the studio can quickly get very messy and chaotic so I like to try and keep it as organised as I can. I’m a bit of a night owl when it comes to making. I love my studio during the day and work from it most days but my favourite time to work there is in the evenings when it’s quiet and everyone else has gone home. I find it very peaceful and I feel I can think more creatively. I drink a lot of tea when I work - earl grey is my go-to. I like to have incense burning too. My studio is a creative sanctuary for me to escape into. 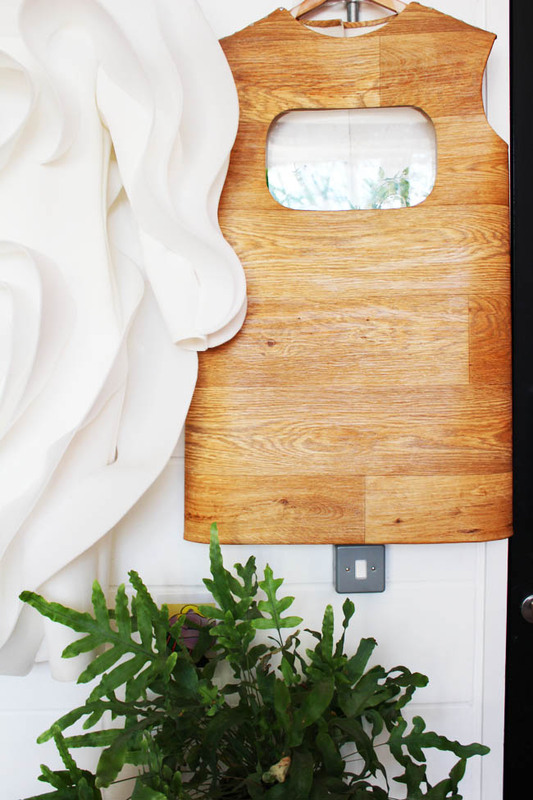 Thank you for showing us around your inspirational sewing space, Kate! We've loved seeing behind the scenes in your studio and we can't wait to see what you make next. 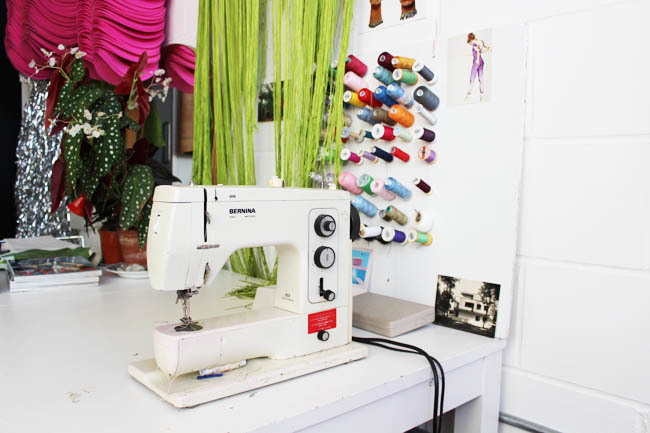 Have you seen the rest of our Sewing Space Tours? Head over and check them out.